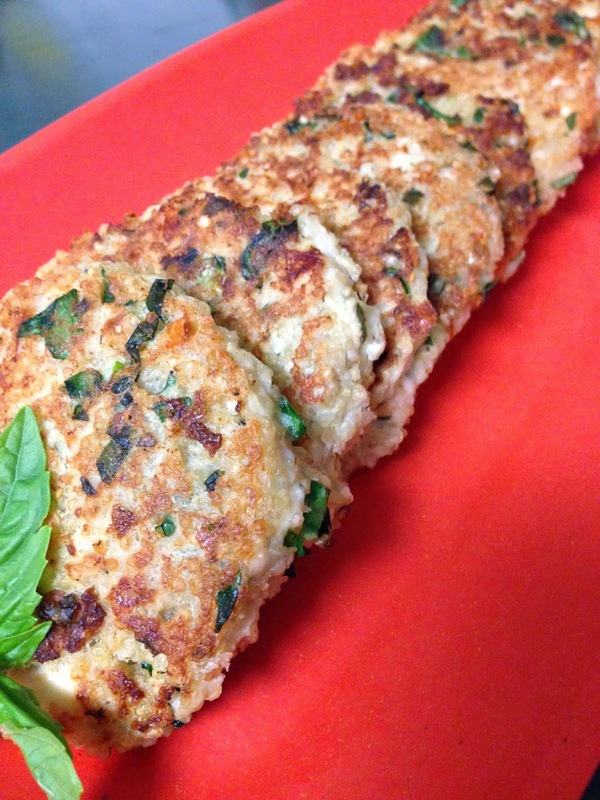 I'm always looking for new and delicious ways to incorporate grains into my meals. Whole grains are delicious and nutritious, but rarely is a pile of whole grains on the side of the plate appetizing or appealing. 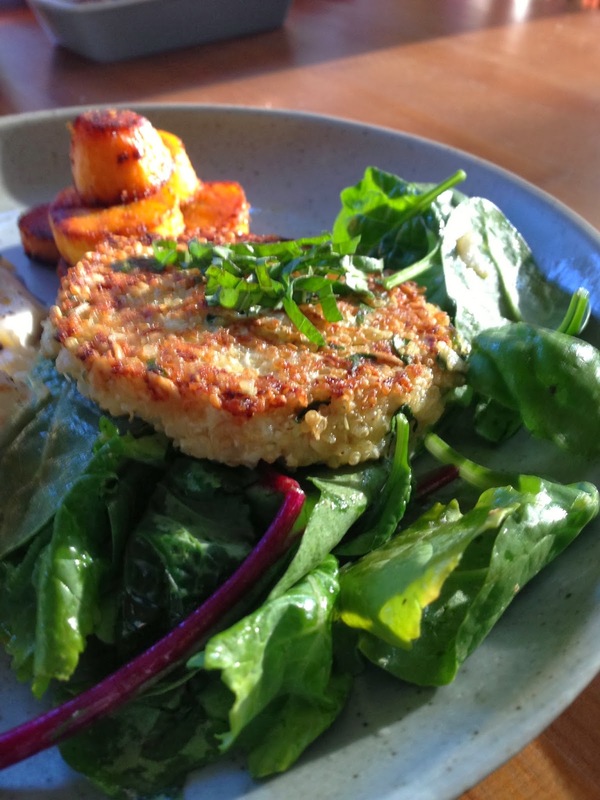 These quinoa cakes are a great way to add a new and exciting food to your plate as a side dish or even on top of a salad for a bit more substance. They can be made ahead of time and reheated or eaten at room temperature as a filling snack-on-the-go. Scott likes them plain with Dijon mustard on top. This recipe makes about 10 - 11 cakes. 1. Cook the quinoa by simmering in salted water on low heat for about 15 minutes. Drain and cool to room temperature. 2. 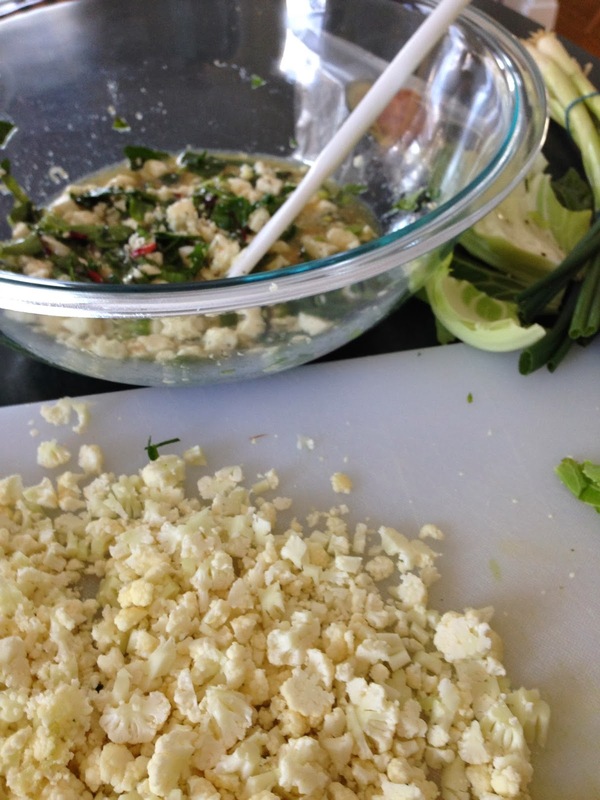 Chop the cauliflower into rice-sized pieces or pulse in a food processor. 3. 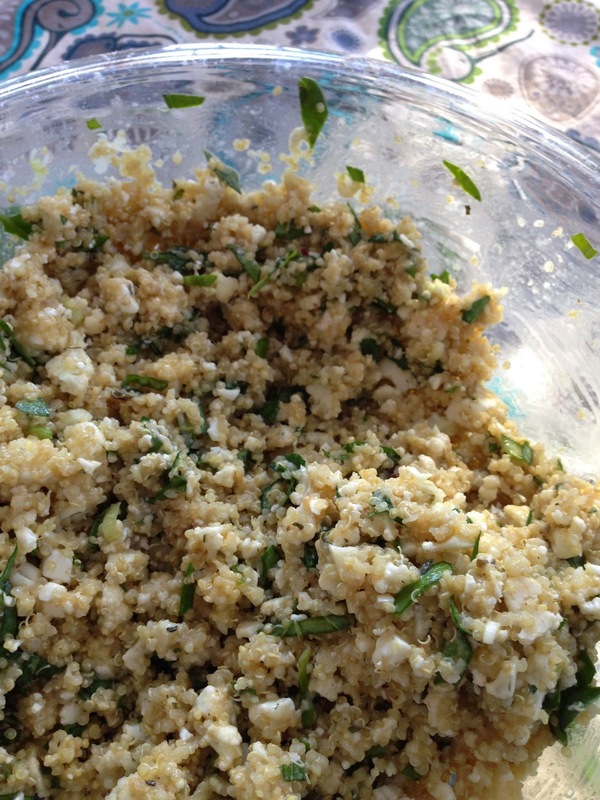 To the cooled quinoa, add the cauliflower and remaining ingredients except for the oil. 4. Place in the refrigerator for at least 30 minutes to set. 5. Heat 1Tbsp of the oil in a large frying pan. Form the patties either by hand or using the lid of a wide-mouthed canning jar (this method makes perfect-sized cakes, and the cakes can be slid off the lid and into the pan). Fry the patties in batches on a medium heat. Fry for 3 - 4 minutes on one side and 2 - 3 minutes on the other side or until golden brown. Use the remaining tablespoon of oil for the second batch of cakes. 6. 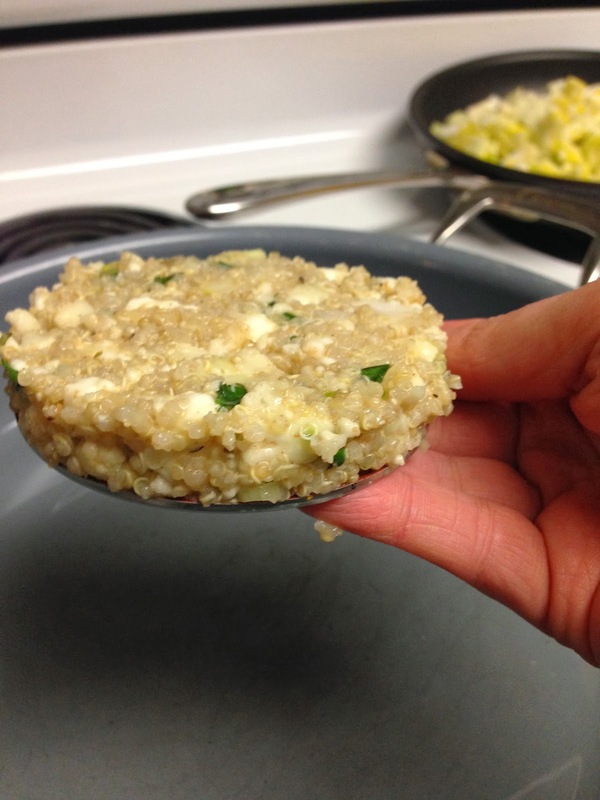 When patties are cooked, transfer them to a paper towel lined plate. If you are saving them for later, put another paper towel overtop and cover with plastic wrap. Enjoy! How to ensure perfectly formed cakes: 1) pack the canning lid full, 2) fry until crispy on the bottom (you will see brown around the edges), 3) do not turn them more than once, 4) use coconut oil which doesn't absorb into the cakes as quickly. 1. 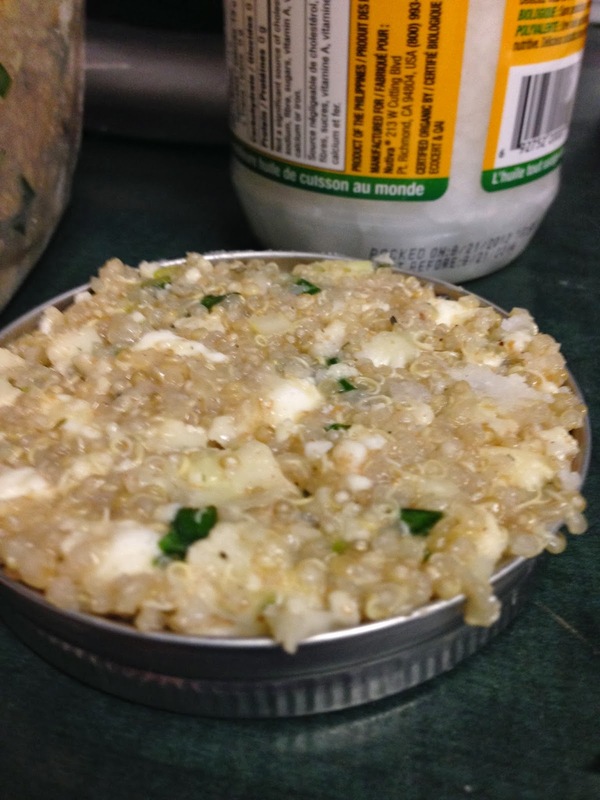 Quinoa may come pre-washed or not - check the side of the bag. If it is not washed, it is important to rinse thoroughly before cooking to get the natural saponin (soap-taste) off. 2. 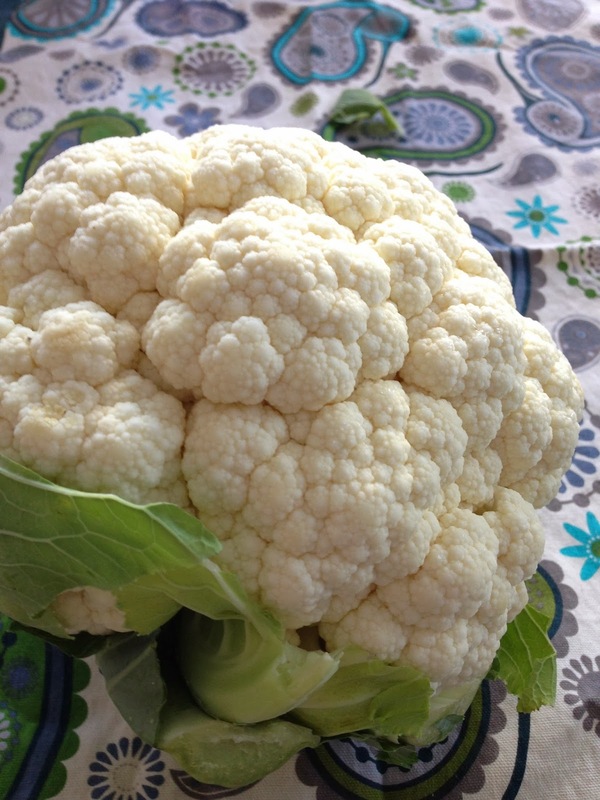 Cauliflower comes in orange, purple, green, and white. Often these varieties are available in the summer at the farmers market. If you can find them, orange, purple, and green are healthier and add an interesting contrast to the patties. 1. As previously stated, these can be eaten warm or cold. 2. Kale can be easily substituted for the spinach. Hi Shannon! I'll bet you thought I'd given up on cooking again, right? Well, as you know, Dad and I have been on vacation plus travelling a lot for work. We've been eating our traditional fare (rice bowls from Safeway, Pita Pit pitas during the week and homemade spaghetti, chilli, lasagna on the weekends). Yes, I know it lacks variety (the lady at Safeway asked me the other day if I get tired eating the same thing all the time!) but we're comfortable with the ingredients and have been just plain busy/lazy. Anyway, I'm glad you've kept this up and, as I said before, I'll definitely purchase a copy when you convert this blog into a fun cook book/biography. Well, I guess we all deserve a break, but remember that your body can't get the wide variety of nutrients it needs if you eat the same thing all the time. I expect you to get back on the cooking trail!